Carpenters wear layers, and rarely argue about whether to set the thermostat at 68, 72 or 76. In fact, on those few halcyon days when temps stay in that neighborhood, it is cause for celebration. If eating your food on makeshift seating while exposed to the elements is a picnic, then the life of the carpenter is a picnic nearly every day. 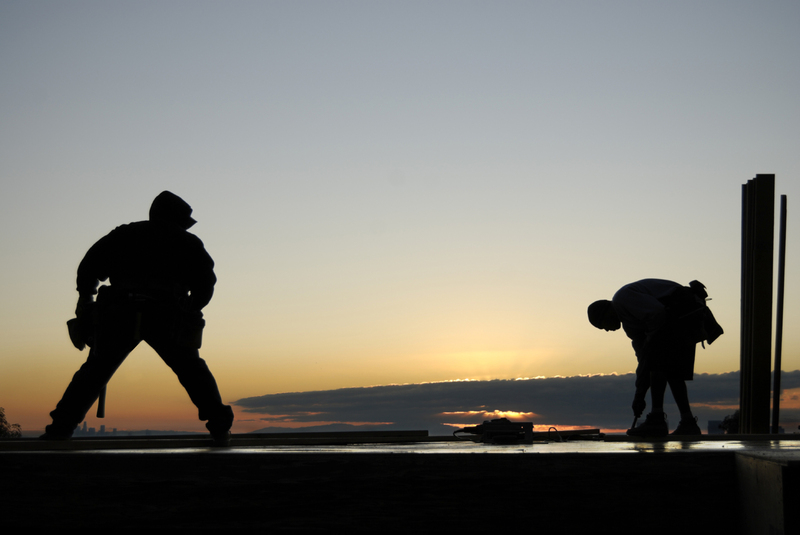 Going to work as a carpenter may mean spending the day in a dank crawl space, a blazing roof top, or a sheetrocked room with a million dollar view. The material of the day may be heart breakingly beautiful wood grain or back breakingly awkward OSB and foam panels, and what it is is usually beyond the carpenter’s control, a result of decisions made elsewhere and earlier by clients, architects, managers. Those decisions can feel capricious. The work of making buildings is full of hazard, discomfort, and disappointment, and lends itself to a certain natural grumpy cynicism. Carpenters know every way in which reality as verified in field can make a joke of plan, schedule, and budget. Carpenters have seen, or at least heard of, every way a beam or a machine can slash, crush, disfigure, or destroy a body, and they work in the shadow of them all. The work of making buildings is hard work, but also full of magic, of spontaneous improvisational genius, and transformation. Carpenters do their work in a world that isn’t square, level, and plumb when they get there, but is (mostly) when they leave. They are mechanics in the old esteemed sense of that word. Character is quickly evident in the way one walks across a cluttered deck, holds a tool and puts it down, and in the way one strikes a line. A carpenter must trust the person on the other end of a heavy load or the other end of the tape, and can therefore be quick to judge. They can also be patient, kind, and generous teachers. Everyone learns from someone else. Carpentry requires camaraderie. At a time when fewer and fewer humans make anything of physical value, carpenters engage in a profoundly creative process, drawing on intellect, muscle, machinery, and materials to produce objects of lasting value, to create shelter, to fulfill basic and archetypal human needs. The carpenter is in some ways mid-wife for the visions and dreams of others, bringing buildings into the world with all the attendant clamor, muck, and uncertainty of birth. It is hard work and, done well, it is honorable, elegant, and inspiring too. This is a heartbreakingly beautiful ode to craft, resiliency, collaboration and just plain old showing up. Thank you, Newell. You remind me that work is a clear and simple way to show your true character. You motivate me to up my own game. Although we always have room to improve, your game is pretty up as it is, Mitch! People reading this might be interested in your blog Clarity First https://clarity-first.com/blog/ which is always compelling and thought-provoking. Thank you Karen. I could write an ode to clients as well, who make it possible for carpenters to practice at the highest level. Thank you for being among that number. We have had the good fortune to serve many wonderful clients who have allowed and encouraged us to stretch our craft. You and Dave are among those who have truly pushed our limits on both craft and building performance at once. Yours is truly a house of and for the 21st century, and beyond. I love that last paragraph Newell. Do you mind if I copy and paste it to my shop/office wall? Bob, thank you. I would be honored! You nailed it Newell! You eloquently assembled the the characteristics a carpenter is built upon! Thank you! These truths are beautiful. Thanks, Newell and the SMCo crews who inspired this. Beautiful Newell! I think I finally know why I keep showing up on a job site and asking to help! I don’t know you, but I know the company you keep well! They are the the reason I can relate so well to your words. I read this when it was published and it has been lingering in my thoughts for a few days. The reminder of old friends and the camaraderie and fellowship of what it means to be a carpenter was a necessary and welcome surprise. Nice blast from our past to hear from you. Here’s hoping all is well for you in Maine; you are missed in Massachusetts. thank you for that ode to carpenters, it was very moving and “oh so meaningful” Three weeks ago we lost a dear friend and a great carpenter, Mike Milner. He was the guy who taught me the trade and showed me how to build everything square and true. I remember one job where, after laying up the ridge and roof rafters, Mike saw the ridge board was not straight (it had traveled an inch or two – over a fifty foot distance and that was unacceptable). We went back and took apart the rafters and blocking. We measured everything a second time and cut the rafters again – to their proper dimensions and when we laid up the new rafters, the ridge board remained straight and true. Thank you for your article, it really hit home. With your permission, I would like to download a copy and give it to Mike’s widow. What a great mosaic of the experienced hands, seasoned mind and forging heart expressing the nobility of a very undervalued calling. Thanks for taking the culture one step closer to restoring that nobility . Thanks to all of you for your comments about Newell’s piece. it really touched a chord far and near. In the coming months it will be appear in Fine Homebuilding Magazine.